​Artec 3D is collaborating with SOLIDWORKS, the market leader of the CAD software to bring engineers and product designers the best 3D experience possible. Now you can capture an object with Artec scanners, create a high precision 3D model and export it into SOLIDWORKS environment in just one click. 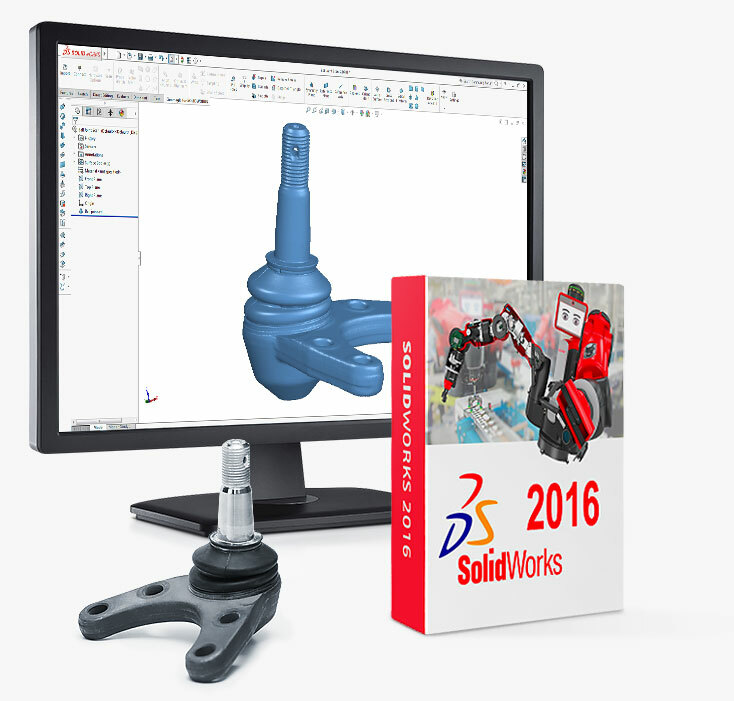 SOLIDWORKS is a widely acclaimed CAD software used by professionals in various industries worldwide. With a wide range of powerful tools, it is the perfect solution for reverse engineering, industrial design, rapid prototyping, analysis and more. 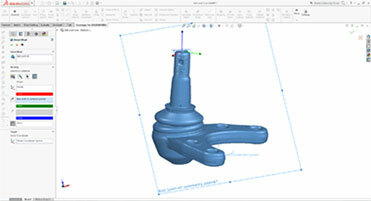 ​Capture and create professional manufacture-ready 3D models in one seamless workflow. ​Artec Studio 11 and SOLIDWORKS licence holders can now export 3D models directly into SOLIDWORKS by using the Geomagic professional plugin, one of the most advanced scan-to-SOLIDWORKS solutions on the market today. 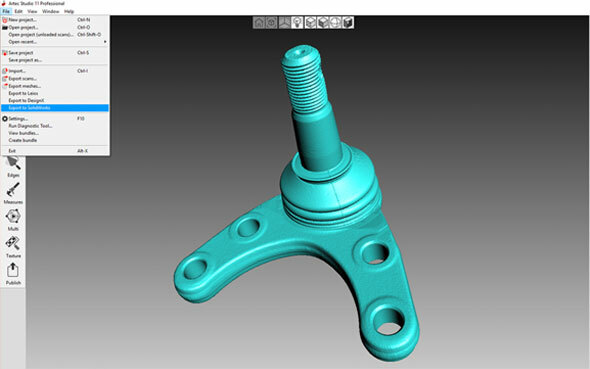 The plugin was designed by 3D Systems with the main aim of transforming all of your 3D scans into editable objects in the CAD environment using a smart and easy workflow, for rapid design, engineering, and production. Geomagic for SOLIDWORKS is replete with tools such as mesh editing, point cloud processing, automatic and guided feature extraction, and fast, exact surface fitting to organic 3D scans. 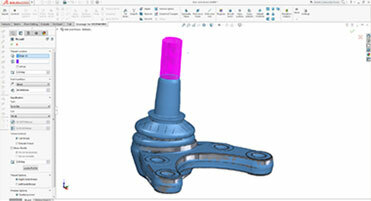 Capture almost any object and create feature-based solid 3D models, ready for manufacturing. 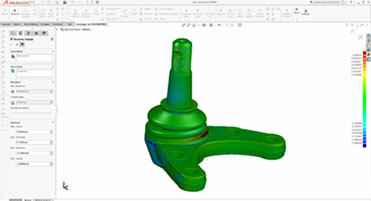 ​Geomagic’s reverse engineering algorithms can reconstruct missing design data in no time, which is especially useful when you need to make old or broken molds anew, or to recreate lost design files. 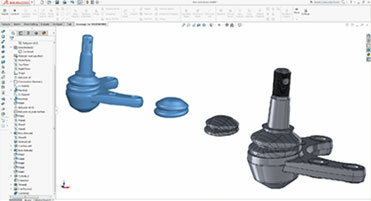 The plugin allows you to easily create both whole designs as well as elements of complex SOLIDWORKS models. 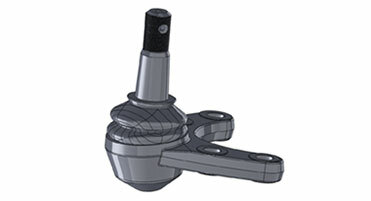 A common application of this feature is customizing prosthetic devices for a perfect fit. A complete scan-to-CAD solution, Geomagic for SOLIDWORKS also allows you to check the feature accuracy of your model with the available standard deviation analysis tool. Enjoy the fast, easy and accurate comparison of CAD and mesh objects. ​Scan an object using an Artec 3D scanner. 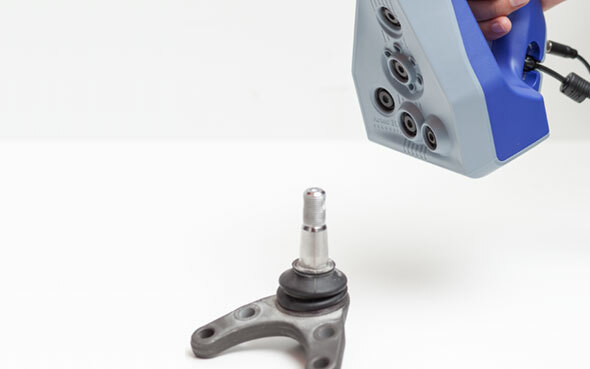 Here, we used Artec Space Spider to capture a ball joint, an object containing several holes. To successfully capture a hole, simply make sure that the scanner can track all or at least most of the edge area. Hold the scanner at a 90-degree angle to ensure the best capture. Once you’re done scanning, you can view and edit the model in the Artec Studio 3D software. Use the Autopilot mode for fast, automatic post-processing with minimal user interaction, or take full control of the process with the manual mode. Click “Export to SOLIDWORKS” in the “File” tab to commence file transfer to SOLIDWORKS and wait for the SOLIDWORKS software to launch. 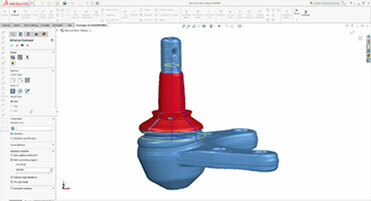 ​View and edit the model in the SOLIDWORKS environment. 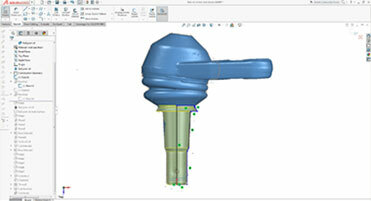 Geomagic for SOLIDWORKS provides the necessary tools to quickly edit and repair scans. Scans can also be aligned to other previously captured scans, as well as to the World Coordinate System. 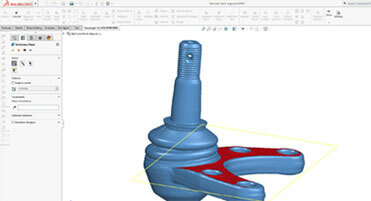 Geomagic for SOLIDWORKS also allows you to extract Ref. 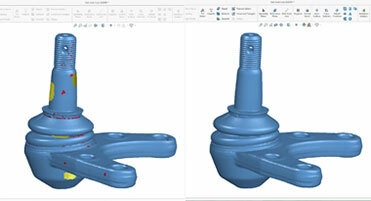 Geometry and create editable, parametric features directly from the scan data. 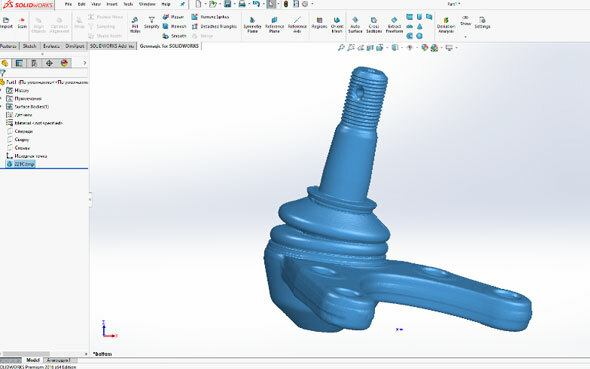 Since Geomagic for SOLIDWORKS operates in the SOLIDWORKS environment, you have the advantage of using the same tools and workflows that you are already familiar with to create models from Scan Data with ease and comfort. Geomagic for SOLIDWORKS also includes the ability to quickly create accurate NURB surfaces, allowing you to capture Organic and Freeform shapes and use them in models of your choice. With Geomagic for SOLIDWORKS plugin, you also have the ability to check the deviation between the SOLIDWORKS model and the scan data. This allows you to create accurate designs and provides a level of traceability. ​Make use of the aforementioned, thanks to the Geomagic plugin, as well as many other useful tools and features in SOLIDWORKS. Transform your workflow and discover new and exciting ways to work with captured data, such as rapid prototyping, quality control, reverse engineering and more. Improve your product’s quality, boost performance and create unique and innovative designs with this leading 3D engineering software. ​Note that in order for the plugin to function, you need to own a SOLIDWORKS license.